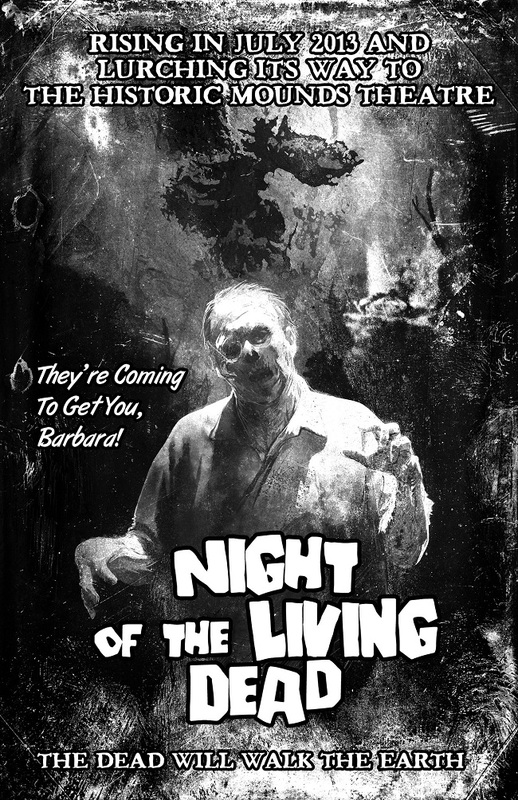 This afternoon we, as a family, went to a matinee of Night of the Living Dead, the play, at the Mounds Theatre in St. Paul. Acting at the Mounds is never top shelf. I think they pull a lot of actors from the local community, so it can be hit or miss. But they definitely try hard and they put some amusing ideas on stage and their productions are always fun. We saw Mort there, based on the Terry Pratchett novel. And they've done Guards, Guards! in the past as well. 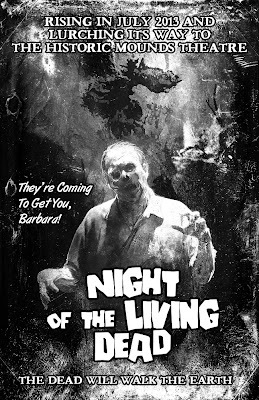 Night of the Living Dead started out with a black and white remake of the car scene in the movie, which ended by Barbara fleeing to the Mounds Theatre where a number of other people were also holing up. At that point it switched to the actors and never switched back to film again except to show an exploding pickup and some zombie cleanup at the end to the tune of Cash's The Man Comes Around, an homage to Dawn of the Dead. During intermission, the zombies all come out to wander around and act like zombies, eating hands, pondering an electric saw, and attempting to use a shotgun. One in a poncho sat down next to Eryn seriously freaking her out. She wasn't having it. And the idea of playing The Man Comes Around on her guitar while dressed as a zombie is apparently right out the door. This picture turned out really well for accidentally leaving on the flash and getting it blurry. She looks like a zombie. We sat on the corner, so most of them walked past us at one point. The little girl zombie came over to sniff Eryn's Milk Duds. You can see a zombie lurking like a stage hand near the intermission sign. As with many zombie-related shows, the humans are overrun in the end, both from the outside and from the inside, where a child bitten by a zombie turns into the undead and dispatches her parents and forces the main character into the conflict of shooting a child. By the end, only the main character is left, holed up in an upstairs loft. When the militia comes to eliminate the zombies, he throws open the doors blocking the loft, exultant because he's saved, and is promptly shot dead by the militia. So the Asian guy lived the longest out of anyone, but still didn't make it through the show.